When the firemen arrived, they were struck by an unusual silence. Only a few flames could be seen flickering through the roof of the fortress-like, cinder-block building, and the men assumed that it was a minor fire. But when they pried open an emergency exit at Le Cinq-Sept, a popular dance hall for youths in Saint-Laurent-du-Pont near Grenoble, two of the firemen fainted. Bodies were stacked before them in ghastly contortions of agony. Fists were literally fried against the locked door. Impressions of hands, arms and heads were fused into the cement wall. Almost all of the 145 dead were young—between 17 and 27. It was France's worst single fire since 1938, when 150 people perished in the Nouvelles Galeries department store conflagration in Marseille. On the night of 31 October / 1 November 1970, the Club Cinq-Sept had drawn a large crowd to watch a live performance by Storm, an up-and-coming six-piece rock group from Paris. There were an estimated 180 people remaining in the club at 1.40 a.m. when a fire, reportedly caused by a carelessly discarded match igniting a foam-filled seat cushion, started in the gallery and spread very rapidly, fuelled by the highly flammable nature of the decor and furnishings. Those caught in the gallery struggled to escape down the spiral staircase as flames spread across the ceiling. Meanwhile in the main club area, around 30 people had managed to exit the premises via the turnstile when, according to survivors, a huge sheet of fire plunged from the gallery, turning the whole building into an inferno. Very few managed to escape after this point, and of those who did, most suffered severe burn injuries. Remarkably, the club had no telephone on the premises. 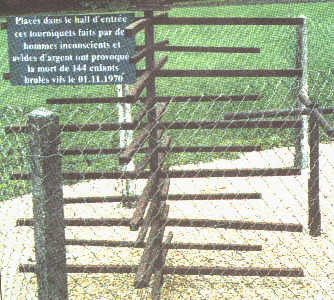 One of the club's managers, Gilbert Bas, was among those who had managed to escape and he had to drive into Saint-Laurent-du-Pont to raise the alarm. The inevitable delay in alerting the emergency services, in combination with the great speed with which the fire had spread and engulfed the building, meant that in effect the disaster was already over by the time firefighters arrived on the scene. In addition to the main entrance, the club had two other external doors. In contravention of fire regulations however, neither was marked and, at the time of the fire, both were locked. A man who had earlier escaped from the building managed to break open one of the doors, through which one woman was rescued alive. Others who had crowded around the door in an effort to escape were already dead by this time. The intensity of the fire completely gutted the interior of the building and caused the roof to melt and collapse. When firefighters were able to enter the building, they found 142 bodies within, most too badly burned for visual identification to be possible. Six badly-injured survivors were transferred to a specialised burn treatment unit in Lyon; four would succumb to their injuries, bringing the final death toll to 146. Two of the club's three managers were among the dead, as were all six members of the group Storm.